About two years ago, I wrote an article on the best Nikon DSLRs under $1000. I included the following four cameras on that list: the D5300, the D5500, the D7100 and finally the D7200. It has been two years since and several new launches by Nikon. So, I thought why not take another look at the best DSLRs under $1000 that Nikon has to offer currently? I am sure there are quite a few Nikonian among our readers, who would love to find out the top models that they can own for a 1000 bucks. Nikon models from the professional segment right down to the bottom entry level segment have been reshuffled. But not surprisingly a few models have continued to enjoy the same level of interest. Needless to say, these models have been pursued by Nikon. The D7200 is one of two models that makes it to both the lists (the one I made two years back and this one). Two years since, the Nikon D7200 is still going strong. 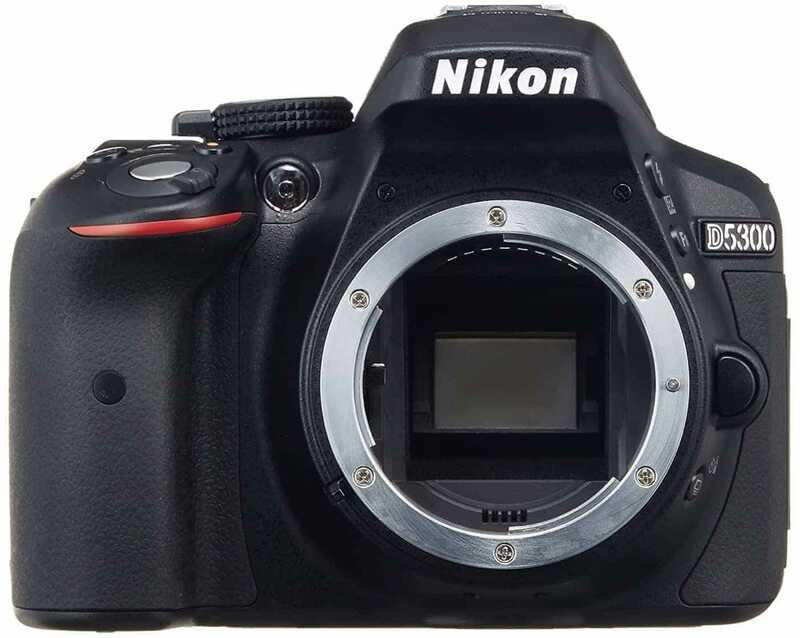 It has been superseded by the more modern and certainly more powerful D7500. But Nikon continues to pursue with this model even in 2018. It is still one of the best Nikon under $1000 that you could purchase now. I have always been impressed with the d7xxx series. I have used several cameras in these series, and they come off as excellent all-round mid-range systems. Yes, they are built around a DX (crop) sensor, and yes, they lack the build-quality and some of the features that are reserved for the top-end Nikon cameras. However, they more than make up for that shortcoming with their versatility and usability. In the right hands, a D7200 is a fantastic camera to shoot practically all types of work. Ok, not everything, but almost everything. The D7200 is built around a similar 24.2-megapixel APS-C sensor as the D7100. Please note that I mentioned ‘similar’ and not the same. There is a tiny difference in the resolution, and that suggests that the sensor isn’t the same that was on the D7100. This sensor has no optical low pass filter on it. The absence of the OLPF means both good and bad. You get sharper images, but you also have increased chances of moiré and false colors. It is paired with an EXPEED 4 image processor as compared to the EXPEED 3 image processor on the preceding camera. A faster EXPEED 4 image processor ensures that the camera can handle resource hogging applications more efficiently. For example, the D7200 is capable of recording full HD videos at a maximum frame rate of 60 fps, as compared to full HD (i) at 60 fps in the older camera. But this feature comes at the price of a sensor crop. That means the whole sensor is not used for shooting full HD videos. However, this is not a huge deal breaker as there was not any camera that could sample the whole sensor real estate when shooting videos two years back. The new processor consumes less power, therefore improving the power consumption efficiency of the new camera. Ratings suggest 1110 shots on a full charge compared to 950 shots with the older D7100. There are other benefits as well. The D7200, just like its predecessors, is built as an all-around system. One of the advantages of that being the decent continuous shooting speed. The D7200 shoots at a continuous shooting speed of 6 fps. 6 frames per second may not sound much, but when you are shooting fast action or sports, an increase in the number of possible frames is a big boost. Of course with this, you also need an increased buffer capacity and the increased ability to write those files to the memory card. This is where the EXPEED 4 image processor comes into play. The AF sensor has been upgraded too. The D7200 comes with the upgraded Mark II of the Multi-Cam 3500 DX 51-point AF sensor. Native ISO capability has been extended all the way up to 25600. You can shoot B&W frames at a maximum ISO of 102400. AF sensor sensitivity is – 3EV compared to -2EV on the older camera, giving you greater flexibility especially when shooting in low light conditions. Auto-focusing mechanism on the D7200 comes with 51 points. 15 out of which are cross-type. I have discussed at length why the cross-type points are way better than single line sensors. The metering sensor, however, did not fulfill expectations. Many of the D7200’s competitors would beat it at its game. Still, on the subject of auto-focusing, continuous auto-focusing with the D7200 is impressive. The camera can maintain focus at all times even when a subject is moving erratically while shooting in continuous shooting mode. The D7200 has some useful features which are geared towards movie shooting. One of them is Zebra stripe highlighting. This feature will mark out the areas which have highlights blown out allowing you to correct the exposure rather than rue the missed opportunity later on. Manual exposure controls is also possible when shooting videos, allowing you to control shutter speed and ISO, maintain a steady exposure in changing lighting conditions (when shooting outdoors). Only problem is there is no manual control over the aperture when you are recording videos. Your aperture is locked at the mark you set when entering into video mode. This would have been a welcome addition and probably what enthusiastic filmmakers would be looking for. Additionally, you have several picture profiles including a flat picture profile and custom tone curves to assist you when you are color grading using your favorite editing applications. But what makes shooting videos, and then switching to stills and then back to videos is the presence of dedicated video controls and the ability to save separate settings for stills and videos. This is an incredible advantage ensuring that you have ready settings to fall back on to whenever you switch from one mode to the other. Further, there is an option to output clean 4:2:2 8-bit footages to an external recorder using the HDMI port. This gives you an advantage by retaining a lot more color information than the standard 4:2:0 recording. Additionally, you will not lose the view through the live-view LCD screen at the back of the camera while you do so, which allows you better control the footages being recorded. Finally, the D7200 comes with a built-in stereo mic as well as the option to plug in an external noise-canceling stereo mic. This allows you to record better quality audio when recording videos. This greatly improves the overall quality of the sound being recorded. But would the D7200 outscore its competition regarding video shooting prowess? Not really. The D7200 does not have some critical features. One of them is the lack of focus peaking. Focus peaking is easily one of the easiest and most reliable ways of manually locking focus when shooting videos. Connectivity options with the D7200 are great. You have built-in Wi-Fi and NFC. Pairing with another device is as simple as tapping the two devices together, and with built-in Wi-Fi, you can transfer videos and images seamlessly. Finally, the D7200 has a weather-sealed design. Magnesium alloy chassis underneath rubber, metal and some plastics make it a robust and dependable camera to take out in any weather conditions. The Nikon D5600 is an entry-level DSLR from Nikon built around a 24.2-megapixel sensor. The same as the D5500 before it. Paired with the 24.2 megapixel sensor is an EXPEED 4 image processor. The same as was in the D5500. Both the D5500 and the D5600 remains on sale at the time of writing this. As does the previous generation D5300. The fact that the sensor does not have a built-in low pass filter means the images are going to be very sharp. But just as in the case of the D7200, the camera will also struggle with fine patterns creating moiré and false colors. The D5xxx series is a fantastic series that combines usability and convenience with simplicity. The D5600 fits in between the D7200 and the D5300 regarding usability and functionality. It firmly sits as the best entry-level camera that Nikon has to offer at the moment. It is a wonderful combination of shooting convenience and advanced features that should excite both the entry-level user as well as an enthusiast who is looking for more than just a camera with manual shooting options. The D5600 has a native ISO capability of 100 – 25600. That makes it ideal for the purpose of shooting in most lighting situations. But remember, this is essentially a crop sensor camera with a high resolution. And that means in low light it is likely going to struggle a bit. The overall low light performance, however, is respectable. The performance is as good as any other camera in the market. The dynamic range of the camera is also very good (dynamic range denotes the number of stops of brightness that the camera can register from the brightest white to the darkest black). Auto-focusing on the D5600 is powered by a Multi-CAM 4800DX 39-point AF sensor. Again, the same as in the D5500. Essentially, this is a 2016 pixel RGB sensor which is a dated technology and something that seriously needs a look at by Nikon engineers. This is the sensor that makes it possible to track subjects and meter a scene. 9 of the central AF points are central cross-type ones. In practical usage situations, the D5600 maintains good subject tracking, even when the subject might be moving in an erratic fashion. But don’t expect that this would be anything close to the D5 or even the D500. These two cameras have been built for speed and performance. The D5600 is an entry-level camera and it is not pretentious. The touchscreen on the D5600 is a superb design. It is functional and extremely easy to use. But at the same time, it is too large for the camera design. The back of the camera is dominated by the 3.2″ tilting and flipping touchscreen. The resolution on the back LCD touchscreen is 1.037 million dots which makes it pretty detailed and a joy to work with. But what is more impressive is the user interface, the software that powers the touchscreen. Unlike the older D5500, the interface on the D5600 has improved, and that is what makes accessing the different shooting settings much easier. The addition of SnapBridge is one area where the D5600 wins over the D5500. If you want a camera that brings together the convenience of shooting with a smartphone, sharing images on the fly and the advantage that comes with a large sensor, then the D5600 is the way to go. The Nikon D5300 is the second camera that makes it to both the list (this one and the one that I made back in 2016). Surprisingly, even after all these years, the D5300 is still on sale. Some online stores, like B&H, however, has it only available on sale after refurbishment. You could get a mint condition one on Amazon. The camera is usually paired with one or two kit lenses. The D5300 is the older version of the D5600 we discussed above. This is a slightly dated camera, with some of the features mentioned in the case of the D5600 missing. This camera is a good entry point into the world of single lens reflex (digital) cameras. It has everything that you need to get started and hone your skills as a photographer. 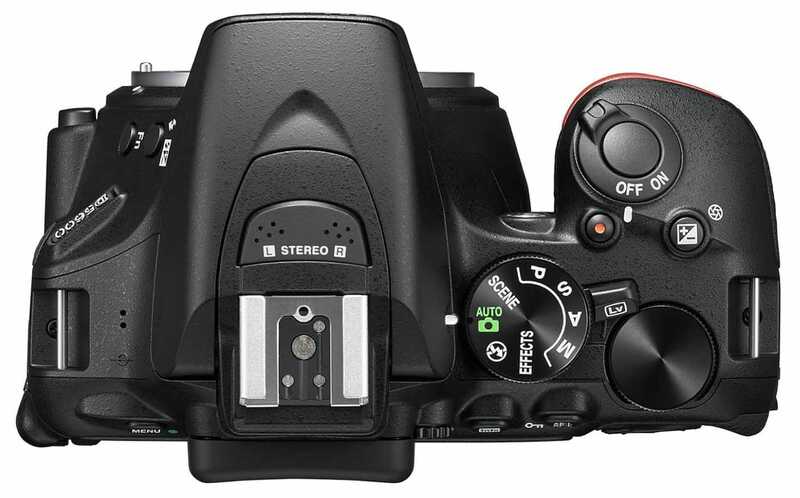 The sensor inside the D5300 is a 24.2-megapixel one and has no optical low pass filter. The lack of optical low pass filter is an advantage and a disadvantage. Thanks to its abilities to capture sharp photos and fumble when fine repeating patterns are in the scene capturing moiré and false colors just as effortlessly as detail. But then a lot of photographers these days wouldn’t mind the absence of the OLPF. Paired with the sensor is the EXPEED 4 image processing engine. The same as the latest D5600. EXPEED 4 is the same image processor that was also used in the D800. EXPEED 4 does give some benefits regarding power efficiency and better image processing. The CIPA rating of the D5300 is 600 shots on a full charge as against 500 on the D5200. Having said that the camera does have wireless connectivity and built-in GPS. Two features that would suggest that the final number of shots may be a lot less if you keep these two connectivity options always on. The D5300 happens to be the first ever Nikon to have both these features. Auto-focusing on the D5300 is powered by a 39-point AF system with nine cross-type sensors. Essentially, this is a 2016-pixel RGB sensor that both meters for the scene and locks focus. Speaking of auto-focusing and still shooting, the D5300 has a continuous shooting speed of 5 fps. Not the best in the world, but still you should be able to capture enough shots that would help you get a few keepers. And I am speaking purely regarding subjects which are moving about. That said, this camera will find itself out of place in a fast action situation or when shooting sports. The reason is this camera can continue shooting even when it appears that the buffer has overrun. The camera will continue to shoot at a meager frame rate of about 2 to 3 frames per second even when it is writing to the card. This reduced shooting speed is automatic and allows you to keep shooting and increases your chances of getting at least a few keepers over several seconds of burst shooting. A 3.2″ vari-angle LCD monitor dominates the back of the camera. The monitor has a display resolution of 1037k dots but lacks the touch properties as the D5600. The lack of touchscreen functionality further discounts the capabilities of the camera of being a great video shooter. Especially, as no second dial can help to adjust the aperture and the shutter speed on the fly. The screen gives 100% frame coverage, unlike the viewfinder which gives 95% frame coverage. In as much as video recording is concerned, the D5300 has full HD video support at a maximum frame rate of 60 fps. The D5300 lacks serious video capabilities, unlike the D7200 or some of the other mid-range (or upper entry level) cameras, Nikon has to offer. You get an internal stereo microphone and the ability to plug in an external microphone that will allow you to shoot and record cleaner crisper sound via an external source. Additionally, the D5300 can output uncompressed RAW footages to an external recorder via the HDMI port. This gives you increased control over the final look and feel of the clips. The D5300 is an extremely lightweight camera. It weighs only 480 grams sans the battery and a lens attached. Significantly lighter than some of the other cameras that it competes with. In the hands, the camera feels very light indeed. The Nikon D3400 is an entry-level DSLR from the house of Nikon. It is the latest entry-level DSLR. Entry level DSLRs are designed keeping in mind the convenience factor as these cameras are primarily used by photographers who are just starting out. The D3400 has its menu and features geared towards this customer segment. 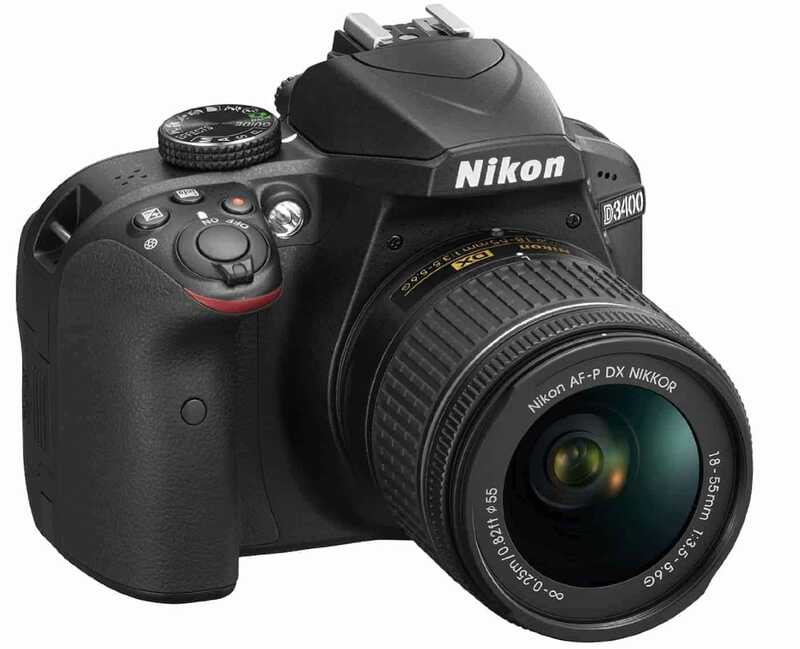 The D3400 is built around a 24.2-megapixel DX-format CMOS sensor and is paired with Nikon’s EXPEED 4 image processor. The native ISO range of the camera is 100 – 25600. This ensures that the camera can shoot in all types of lighting situations. The new 3400 is in many ways the same D3300 which came before it with some minor adjustments. Auto-focusing on the D3400 is powered by an 11-point AF system same as the older camera. There is only one cross-type AF point, and that is at the center. The 11-point system is archaic and does not do justice to the fact that you could try to shoot more than just still subjects. Regarding connectivity, the camera is Bluetooth capable but not Wi-Fi capable. For some strange reasons, Nikon has decided not to incorporate the camera with built-in Wi-Fi. You have to pair the camera with a compatible device via SnapBridge and transfer images using Bluetooth. Speaking of still shooting the D3400 has a modest continuous shooting speed of 5 fps. The same as the D3300 which came before it. You will not be able to use this effectively to capture images at high speed, fast action type situation. But should be more than enough for every other situation. A 3″ LCD screen dominates the back of the camera with a resolution of 921,000 dots. The screen offers 100% frame coverage and ensures that there are no surprises when you are composing with it. The thing that we miss, however, is the absence of touch properties as well as the inability of the screen to flip and tilt. This severely limits the applicability of the screen for shooting videos with it. Another conspicuous absence is the external mic input. For even an entry-level videographer the ability to record sound-bites via an external mic is important. This greatly improves the quality of the production. The D3300 does not have one. Though the D3400 and its predecessor the D3300 share many features in one area, where the D3400 beats the older camera is the battery life. Ratings suggest that the D3400 has a considerably high number of possible shots when compared to a D3300. The D3400 has a less powerful built-in flash which is another point of difference. The lack of Wi-Fi and the inability to plug in an external mic when recording videos is another area where the D3400 falls short. Without a doubt, the Nikon D7200 wins the tag of the best Nikon under $1000. This is an all-around camera, great for shooting stills in most shooting situations and good enough for shooting videos as well. All the four cameras on this list are APS-C shooters. All of them have similar resolution sensors. But even then there are significant differences between each of them. 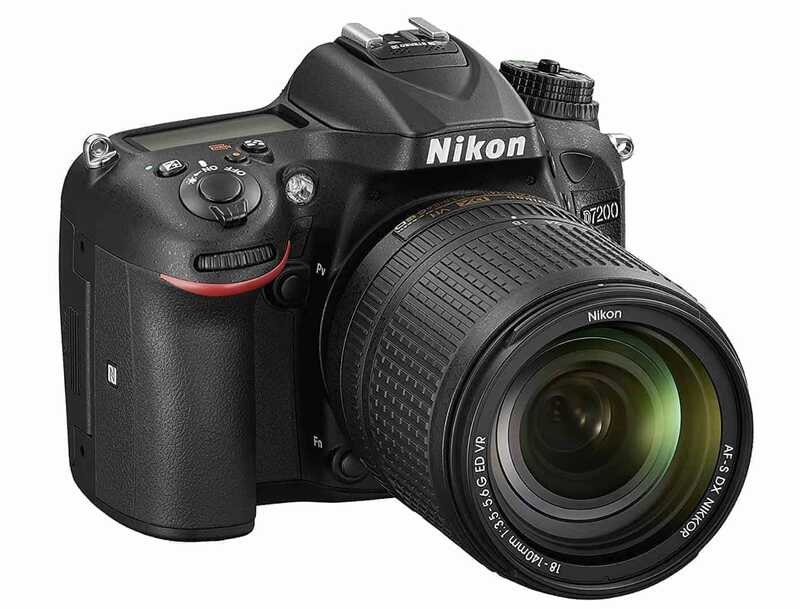 The D7200 has the best continuous shooting speed and the best video mode among all the four cameras here. It has the most number of AF points and cross-type AF points. Dedicated video controls, the presence of zebra stripes and the ability to use a flat picture profile makes things a lot easier and more gratifying to shoot with the D7200. Additionally, the D7200 is a sort of an all-weather design. It comes with good weather sealing as well. The Nikon D5600 is a distant second in all these departments.